Our original itinerary called for us to cruise Tracy Arm today. However, we were awakened just before 9:00 AM by an announcement from our captain. He said that there were winds of 40 knots in Tracy Arm, which is a narrow passage. Because he deemed it unsafe to enter Tracy Arm in such windy conditions, we would be cruising Endicott Arm instead. Tracy Arm and Endicott Arm are two deep fjords near Juneau in the Tracy Arm – Fords Terror Wilderness area of the Tongass National Forest. Both fjords are more than 30 miles (48 km) long, and about one-fifth of their area is covered with ice. Endicott Arm is shorter and wider than Tracy Arm. 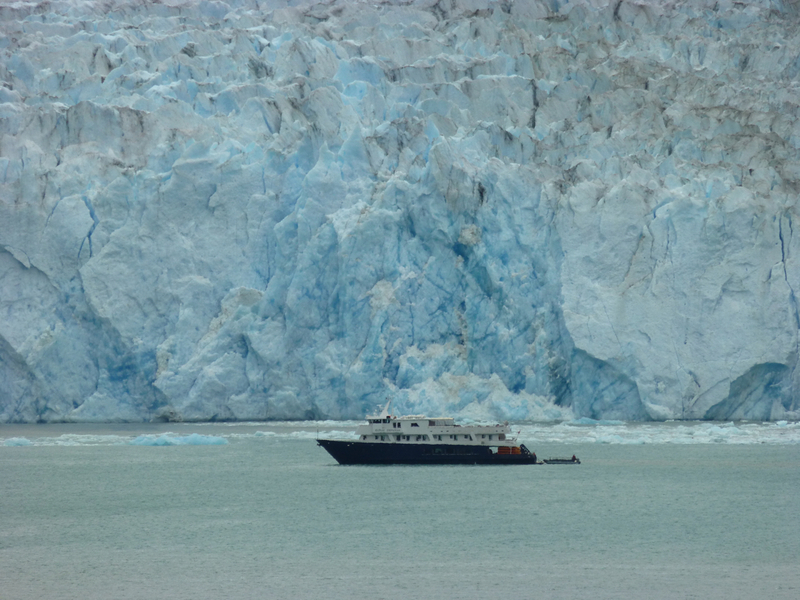 As the ship entered Endicott Arm, people flocked outside to watch our approach to Dawes Glacier, a wall of blue ice half a mile across. The captain even opened access to the ship’s bow so we could get a good look. The massive wall of blue was visible from a distance and became more and more spectacular the closer we got. I was surprised at how close we were able to get in such a large cruise ship. There was a much smaller ship that got even closer, but we get a good look even though we were farther back. Now I wish I had paid more attention to those earth science units we studied back in junior high. I always found them supremely boring. If I had taken them more seriously, I would probably have better understood how the glaciers carved out the terrain here during the last Ice Age and appreciated how several glaciers come together here today. Eventually the captain pivoted the ship around and we headed back out into open water. Here are three photos from our visit to Dawes Glacier. Click on photos to see larger versions. 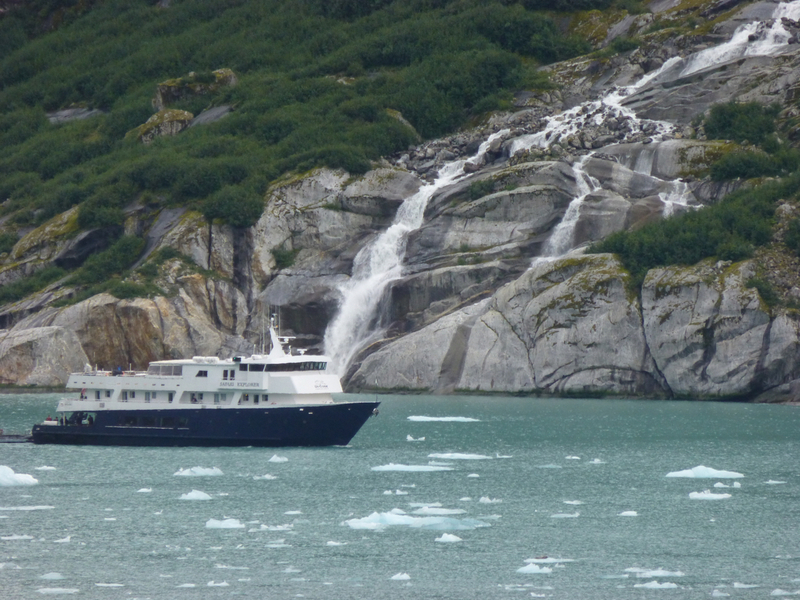 This is the same small boat cruising away from the glacier, past a waterfall fed by a melting glacier. 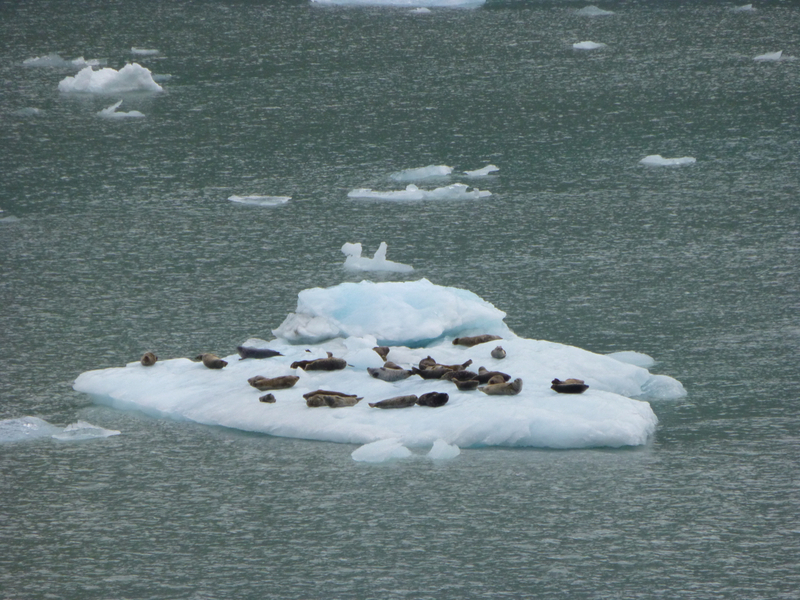 Seals relaxed on several small ice floes that drifted past our ship and out to sea. This was the largest, most highly populated hunk of ice.